19.11 Germany, Italy, Britain and France may build new ships and continue the construction of existing ships. Russia may not build ships. 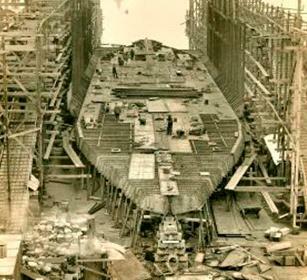 19.12 Shipbuilding is done secretly and the results revealed simultaneously at the end of the economic phase. 19.13 Each major power’s shipbuilding is limited by the activity counters it assigns to shipbuilding, its shipbuilding rate (19.3), shipyard capacity (19.4) and the restrictions set out in 19.63, including whether unused ship counters are available. 19.22 When new ships are laid down, they are placed on the naval construction chart. As construction continues, ships are moved down the naval construction chart until they reach the bottom row, when they are launched. B. GERMANY, ITALY, FRANCE: 2 each. 19.32 Germany, Italy and Britain may increase their shipbuilding rates by one by mobilizing a shipyard. Germany, Italy and Britain may only mobilize one additional shipyard per game. A. ACTIVITY COUNTERS: Germany, Italy and Britain each add a 1 activity counter that may only be used for shipbuilding (12.22C). B. AXIS SHIPBUILDING INCREASES: Axis shipbuilding increases trigger Allied support increases as set out in 10.71C (Britain) and 10.81C (France). 19.34 The number of ships that a major power lays down or advances in a turn may not exceed its shipbuilding rate. A. BRITAIN: 6 ships (8 ships if Britain mobilizes a shipyard). B. GERMANY: 4 ships (6 ships if Germany mobilizes a shipyard). C. ITALY: 4 ships (6 ships if Italy mobilizes a shipyard). 19.42 The number of ships that a major power is building may not exceed its shipbuilding capacity. 19.51 In any given turn, shipbuilding may involve laying down new ships and continuing or accelerating the construction of existing ships. A. BEGINNING AND CONTINUING CONSTRUCTION: Activity counter points equal to the size of the ship, minus one for each positive EAI or plus one for each negative EAI, to a minimum cost of one activity point per ship (the higher the EAI, the cheaper it is to build ships). B. ACCELERATION: One activity counter point to speed a ship up by one turn; two activity counter points to speed a ship up by two turns (19.73). 19.61 LAYING DOWN NEW SHIPS: New ships are placed in the row corresponding to their size and the column for the season of the turn in which they are laid down. 19.62 SHIPBUILDING ACTIVITY COUNTER REQUIRED: A new ship may only be laid down using at least one activity counter associated with a shipyard. This requirement limits the number of new ships that may be laid down by each major power each turn to the number of activity counters associated with a shipyard it has (12.21). This requirement does not apply when a random event allows a ship to be laid down at no cost. All carriers in Gathering Storm are 2-factor aircraft carriers (CVLs); larger carriers may not be built. Only Germany, Italy and Britain may build carriers. Germany must achieve a naval air training result before building any carriers and is then limited to building no more than three carriers unless it achieves a second naval air training result. Italy must achieve a naval air training result before building any carriers and is then limited to building no more than three carriers unless it achieves a second naval air training result. A German naval air training result does not permit the construction of Italian carriers. Similarly, an Italian naval air training result does not permit the construction of German carriers. At the start of the game, Britain has one naval air training result and has already built three carriers. Britain is therefore in the same position as Germany and Italy; before building any additional carriers, it must achieve a second naval air training result, and may then build no more than three additional carriers until it achieves a third naval air training result. Italian and French 3-factor capital ships are referred to as battleships; German and British 3-factor capital ships are referred to as battlecruisers. There are no restrictions on the construction of battleships and battlecruisers. C. MODERN BATTLESHIPS: 4- and 5-factor battleships are referred to as “modern battleships”. A major power may only build 4-factor battleships only if it has achieved a battleship design research result (16.13B). A major power may only build 5-factor battleships only if it has achieved two battleship design research results (16.13B). D. LIGHT SHIPS: Light ships are not represented in Gathering Storm. The starting levels of cruisers, destroyers and other one-factor naval units in A World at War are unaffected by the number of turns played in Gathering Storm before the outbreak of war, but may be augmented by research. 19.71 CONTINUING CONSTRUCTION: The continued construction of a ship already in a shipyard is permitted in the season corresponding to the seasonal column in which the ship is located. A. The cost of continued construction is the same as for laying down a ship - the size of the ship, minus one for each positive EAI or plus one for each negative EAI, to a minimum cost of one activity point per ship (19.52A). B. Continued construction of an existing ship, as opposed to laying down a new ship, does not require the use of an activity counter associated with a shipyard (19.62), although such an activity counter may be used. C. The ship is moved down one row in the same column. 19.72 DEFERRING CONSTRUCTION: Naval construction may be deferred. A ship that is deferred is moved along the same row one column to the right. Naval units in the “Winter” column are moved to the “Spring” column. Completion of construction is thereby delayed one turn. 19.73 ACCELERATING CONSTRUCTION: Naval construction may be accelerated by spending an additional one or two activity counter points. A. After advancing the ship down one row from normal construction, the expenditure of one additional activity counter point moves the accelerated ship down one row and one column to the left, so the next opportunity to advance the ship comes one turn earlier than would otherwise be the case. B. After advancing the ship down one row from normal construction, the expenditure of two additional activity counter points moves the accelerated ship down one row and two columns over in either direction (a “knight’s move”, in chess terms), so the next opportunity to advance the ship comes two turns earlier than would otherwise be the case. C. The EAI does not reduce or increase the cost of acceleration. D. Random events may allow the acceleration of ships at no cost, regardless of the seasonal column they occupy. Acceleration from random events occurs before or after normal naval construction, at the option of the major power that drew the random event. Acceleration from random events may be applied to ships in columns other than that of the current turn. Such ships move one or two columns to the left along the same row, depending on the random event. Ships in the Spring column move to the Winter column. A ship that moves into the column for the current turn may be advanced to the next row, at the normal shipbuilding cost (19.71A). Similarly, a ship that moves through the column for the current turn may be advanced to the next row, at the normal shipbuilding cost, after which it is moved to the next column to the left. If normal acceleration may be described as a “knight’s move” (19.73B), then advancing a ship during acceleration is similar to en passant. Non-chess players should think about invading Russia. E. Acceleration is not allowed when a ship is first laid down. 19.74 LAUNCHING SHIPS: Ships are launched when they reach the “Launch” row of the Naval Construction Chart. A ship no longer counts against the shipyard capacity of the constructing major power on the turn it is launched. A. Tile points may be spent for activity counters associated with a shipyard and the use of the shipbuilding points generated by those activity counters postponed until a future turn. B. The maximum number of shipbuilding points that may be saved in this manner is limited to the major power’s shipbuilding rate (19.3). C. Shipbuilding points may be saved in a turn in which a ship is deferred. D. Saved shipbuilding points are tracked using the saved shipbuilding activity counters included in Storm Over Asia, which are placed on the applicable shipbuilding portion of the mapboard when purchased. E. Saved shipbuilding activity counters may not be used to meet the 19.62 requirement that at least one activity counter associated with a shipyard is required to lay down a new ship. EXAMPLE: Italy spends one tile point in Spring 1936 to use its 1 shipbuilding activity counter associated with its shipyards and saves the shipbuilding point. In Summer 1936, Italy may retain the saved shipbuilding point, possibly saving a second shipbuilding point in the same manner, or use this saved shipbuilding point as part of the cost of advancing one of its three-factor battleships. 19.76 SCRAPPING SHIPS PROHIBITED: Construction of ships may be continued, accelerated or deferred, but ships may not be eliminated in order to free shipyard space for the construction of other ships. A. SHIP LAUNCHED: A major power launches a ship, regardless of type. B. MODERN BATTLESHIP LAID DOWN: A major power lays down a 4- or 5-factor battleship. If the 4- or 5-factor battleship is launched before the end of the game, a second Axis or Allied generic ship counter is placed on the naval Balance of Power Chart (19.81A). 19.91 THE BATTLESHIP RACE: The alliance that is ahead in modern battleship construction receives a balance of power modifier of one in its favor, regardless of the naval balance of power. 19.92 BALANCE OF POWER MODIFIER DISTINCT: The alliance that leads in the battleship race receives a +/-1 balance of power modifier, distinct from the naval balance of power modifier. The battleship race modifier is unaffected by the maximum +/-3 value of the naval balance of power; if the Allies have a -3 modifier in the naval balance of power and lead in the battleship race, they receive a total -4 balance of power naval modifier. If one alliance has launched two or more 4-factor battleships than the other, that alliance has the lead. If neither alliance has launched two or more 4-factor battleships than the other, 4-factor battleships on the “2” row of each major power’s naval construction chart, regardless of the exact season (column), are included in the calculation. If neither alliance has launched or has on the “2” row two or more 4-factor battleships than the other, 4-factor battleships on the “3” row are included in the calculation. If the battleship race is still tied, then 4-factor battleships on the “4” row are included in the calculation. If neither alliance has the lead when all launched and building 4-factor battleships are taken into account, the battleship race is tied, and the +/-1 balance of power modifier is not applied. 19.94 5-FACTOR BATTLESHIPS: If a major power has achieved two battleship design research results and started construction of a 5-factor battleship, the lead in the battleship race is determined as set out above solely in relation to 5-factor battleships. If the 5-factor battleship race is tied, then the alliance with the lead in 4-factor battleships has the lead in the battleship race, with any surplus 5-factor battleship being treated as a launched 4-factor battleship. Leading by a single 5-factor battleship isn’t sufficient to win the battleship race, but this gives the owning side a leg up in the 4-factor battleship race.